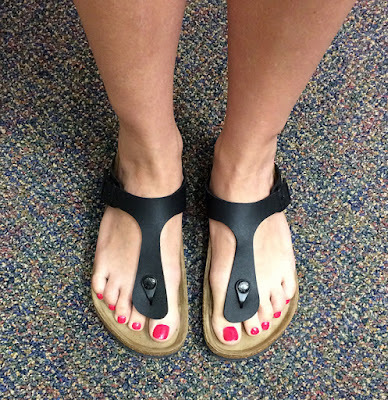 Looks Good from the Back: Birkenstock Gizeh Review and Fit. Regular readers might have noticed that I've been a little obsessed with the Birkenstock Gizeh lately. Hippie comfort shoes are not generally my thing but there's something about certain styles of Birkenstock that get an exception from me and when comfortable things become fashionable, I like to take advantage of it. But hell, I wear them anyway and really, it's fine. I've broken them in and my toes are still happier than when shoved in high heels. However, when considering the purchase of a new pair I couldn't decide what size to get. I wear an 8 which Birkenstock says is a 39. My old pair is a 38 but they're also the (slightly) different Papillio style and what if they run smaller? Ugh. 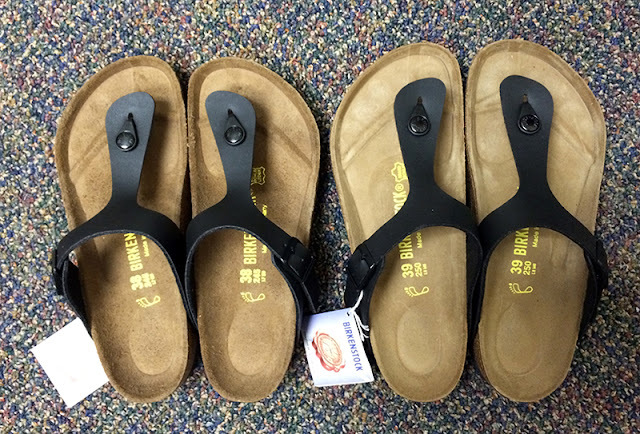 So, I ordered both sizes of the black Birko-Flor version from Zappos VIP and figured I'd return the other pair. Zappos, being the magical monkeys they are shipped them immediately via One Day Business. Hooray! Then they promptly vanished. Boooo. I finally called on Friday about my disappeared order and they re-shipped them immediately and gave me a $30 credit for my troubles. Zappos is the best, y'all. The 39s just felt better. My toes have room, my weird square feet have space to sit more comfortably and the straps had a bit more height, so even in the same hole setting they weren't pressing on the tops of my feet like the 38. One important note about the Gizeh: the thong part is made of fairly thick plastic and it takes some getting used to. Some people hate it. I know my first pair definitely took some breaking in, but I feel like Birkenstocks in general require a bit of break-in. The footbed is pretty firm and takes a while to mold to your feet. Just something to keep in mind if you buy a pair and they initially hurt your feet. Give them a few wears first! As always, nobody ever sends me free stuff ever (WHY IS THIS?) 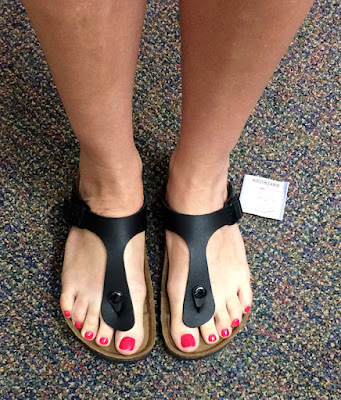 including Zappos, so these sandals were purchased with my own dollars and my review is as honest as I can make it. I just bought a second pair too. So comfy. Nordstrom Rack has had them off and on online. I really really needed to have a Birkenstock person fit me for my Arizonas - so many variables! I have a narrow foot and wear a size 8-8.5 and just received these in a 29 narrow. There is a bump on the outside heel area of this shoe that hits my heel uncomfortably. Im wondering if I need a 38. If I move my heel back in the footbed, this bump doesn't hit quite as hard (but still feels a little uncomfortable) but then my toes are too far back from the front to walk... Has anyone noticed these outer heel bumps in the shoe and why are they there and is that normal and they will compress or ? Thanks. They do come in narrow and regular and wide.